Phil Langley, director of Bryden Wood (left) with Jozef Dobos, CEO of 3D Repo. 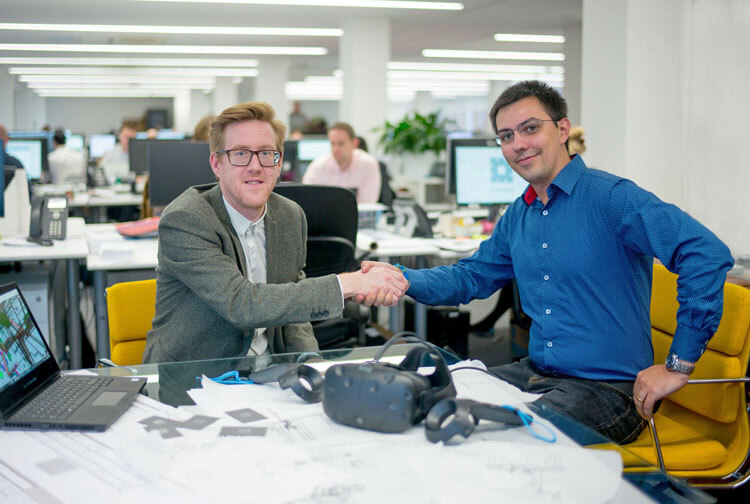 London — 3D Repo is partnering with Bryden Wood to develop 4D sequence visualization features for their database-driven Digital Construction Platform. These features will allow users to visualize 3D construction projects, over time, directly from existing BIM models. Outputs will be viewable not only in 3D Repo’s web-based platform, but also by loading directly from the cloud and viewing via virtual reality (VR) headsets such as Oculus and HTC Vive. 4D modeling refers to the fourth dimension of time, so 4D schedule is a 3D model that includes the construction sequencing. This enables teams to analyze events on a time-line and visualize the duration it takes to complete tasks within the construction process. 3D Repo and Bryden Wood will be launching this new development at the upcoming Digital Construction Week (Oct. 18-19), where visitors will be invited to try out the solution for themselves at 3D Repo’s VR workshop.